Cool shot. I wish the hair (book?) at the bottom right hadn't been clipped. I love this, great contrast. Love this! I hope to see it in the top 10.
great silohuette. love the contrast. this is a great silouette! 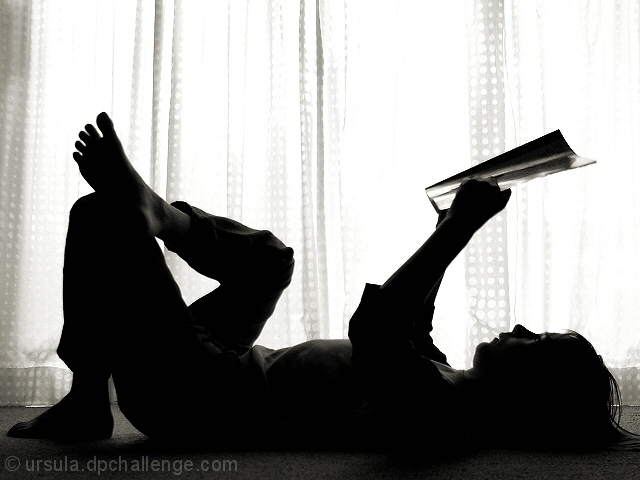 the lighting perfectly cast just enough shadow, yet still highlights the book, foot, body and hand of the child (?). I especially love the glint in the eye. It evokes a feeling that the reader is captivated by the story - the expression continues in the hint of "wow" in the mouth. Great photo. The light of the window sets the mode and calmness of this image. Good contrast. Very nice job! I love the contrast between the child and the curtains. Curtains maybe alittle blown out in areas, but I'm not sure that could be helped. I like this one a lot. A simple but effective application. Subject is very well backlit. Just enough detail showing through to get a good sense of the subject without seeing too many colours that could have been distracting. Great silhouette. The lighting is perfect. Composition is interesting. This would make for a great post or greeting card. I like the silhouette, I like the lighting, the use of B/W is good. Great silhouette. Creative. The patern on the drapery even helps this image, I think. Good luck. I love this shot. The back-lighting makes it great. It looks like a position you would actually find a kid in. 10 from me. Proudly hosted by Sargasso Networks. Current Server Time: 04/24/2019 12:44:08 PM EDT.